In a further indication of the trend, economic research firm IHS Global Insight predicts that while there will be just a 1.6% increase in all U.S. jobs this year, the number of manufacturing jobs will climb 3.2%, the Journal says. Ever since the nonprofit Reshoring initiative, at least 25,000 manufacturing and related support jobs have been brought back to the United States from abroad. This is a great sign for our economy, but also a great shift for manufacturers, and enterprise resource planning (ERP) software is ready for them! Although bringing jobs back is great on many fronts, manufacturers need to stay efficient to maintain their success. Using the right ERP software is important for staying organized and can help build efficiencies throughout your business. Microsoft Dynamics® GP is a comprehensive ERP solution that can manage finances, manufacturing, project and services management, supply chain, human resources, as well as provides powerful business intelligence and reporting features. 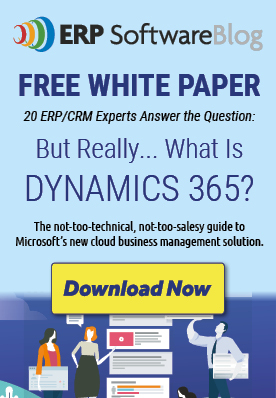 Achieve greater visibility throughout your operations by using ERP software, like Microsoft Dynamics GP. You will be able to see the connections between manufacturing, supply chain, inventory, and how they can affect the bottom line. Software that is easy to use will improve productivity of your workforce. Your teams can enter data faster and easier and you can see more accurate, real-time data when you need to make the decisions that drive business growth. Microsoft Dynamics GP also adds automation. For example, you can route approvals faster and receive alerts on the metrics that are important to your job responsibilities. Receive alerts when budgets are close to exhaustion, when sales goals are met, or when inventory reaches certain levels. Manufacturing operations are often complicated with long supply chains, different types of manufacturing (make-to-stock, make-to-order, etc. ), and often many locations. Microsoft Dynamics GP can streamline communication and collaboration of all of your operations. All the data you need can be found in one software location, instead of several disparate software programs. Getting the critical data you need is far easier and takes less time when you know where it is and you have access to it when needed. The right ERP software will help manufacturers achieve the greatest efficiencies. Microsoft Dynamics GP can improve productivity at all levels, which will also improve profitability. Give your team the right software for the job so they can work smarter, and not harder. Contact Sherwood Systems for more information about Microsoft Dynamics GP and how it can streamline and strengthen operations. Why Do Businesses Need ERP Software?